I usually never write reviews for apps but this app works. If you follow the program you going to lose the weight. I lost 11 pounds in seven days. It is a hard program and in the beginning you get the small headaches and you get the food craving but if you stick with it you'll get great results. 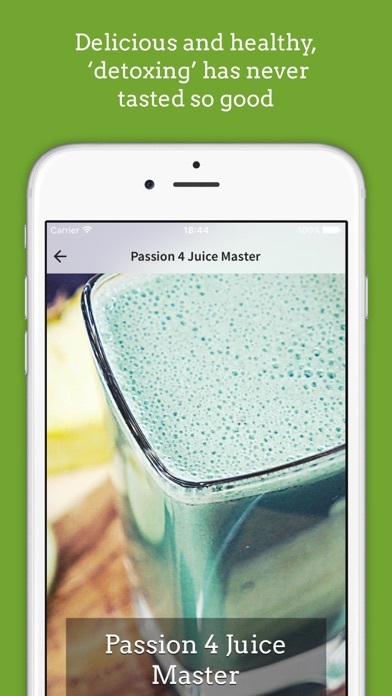 As far as the app itself I love the how to videos that show you how to make the juices. Little small crashes here and there but other than that the app works fine. I lost 6 lbs in the first 4 days. The juice recipes are delish! And the shopping list in the app makes it super easy to get organized!! This is a great program! Definitely recommend this app! I love this!!! It does what it says it can do and then some!!! Just stick with it and you WILL FILL AMAZING! I really like the updated version of this App. Smells fishy when I need to buy the supplements. Uh oh.The marketing spin is definitely on here. I love this app! I tried juicing once before without any guidance on what i should juice together, and quickly stopped juicing. 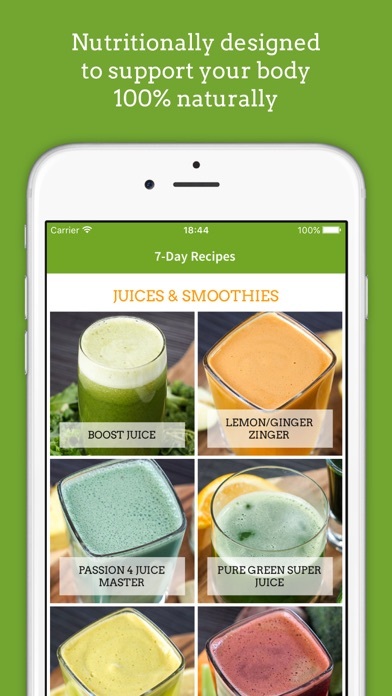 It wasn't until I got this app that I am really enjoying the benefits of juicing. I semi tried doing the 7 lbs for 7 days to see if I was able to stick with it. I juiced all day except I had dinner ( it doesn't help when your spouse doesn't juice). To my surprise I lost 2 1/2 lbs in 5 days. And I didn't even exercise. I can not wait to do the full 7 lbs in 7 days as it was intended. Happy Juicing!!! Jason vale is amazing. Not only did I lose the 7lbs but I feel fantastic! I feel light and clean!! Highly recommended!! Nice to have for shopping list and watching the video as you make each juice. Layout better on this upgrade. The recipes all taste fabulous. The daily motivation videos are great. 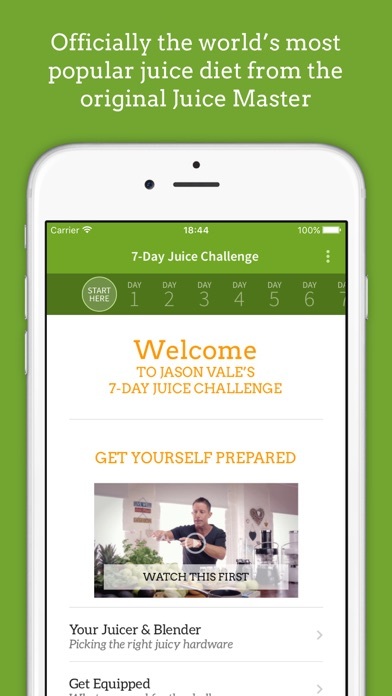 I'm a believer and love juicing thanks to Jason and this great app! I did follow the recipes each day but wasn't hungry or didn't crave a thing and I actually did two less juices a day as I wasn't hungry. I have been continuing to juice and feel like I'm on track to be healthy and slimmer. App is not worth the money you pay! The program might be useful. I bought it so I could do a fast start on the plan (meaning I hadn't read the book...) but I also wanted the shopping list on my phone. The app worked good for me, of course it would help to read through the recipes first to make sure you have staples like fennel seed or cinnamon. Found the program itself great and really enjoyed the audio and video coaching built into the app. The app is far to pricy for what it offers. Upon purchasing, I was disappointed I was really only buying an infomercial with a few teaser recipes. I did the 7lbs in 7 days and lost an amazing 12 lbs. The app helped so much. Loved the videos on how to make the juices but when I went on to the 14 days program there are no videos and the recipes seem to be off a bit. Like the carrot cilantro soup, I had to add more broth then the recipe asks for in order to make it a soup instead of a paste. And I haven't lost anymore weight and I'm on day 6 of the 14 day plan. Was going so well. I suggest not to buy the 14 day plan until problem is fixed. The plan is easy to follow. The juices are tasty and I lost 7lbs! The plan may not be for everyone, but this app makes it really easy to try. The shopping lists and videos are great. Plenty to keep my moods stable and no hunger!! Be sure to drink lots of water!! Hubby and I are on Day 5 and I lost 8 lbs, I was skeptical at first but I have to admit this one works.... First couple of days were tough but we made it through. Just purchased. Love the high energy in presentation of the info. Videos nicely done. Looking forward to the program. Wish me luck. Great app! Works, just stick to it. So easy! Jason has words of encouragement for you on each of the 7days. What he says is true you will lose the weight. I didn't need to lose any just wanted to detox but ended up losing 9 pounds over 5 days to my surprise! I was extremely skeptical when a friend recommended this app. Always thought healthy juices were supposed to taste terrible. So not true. Love the taste of the recipes and haven't had any cravings for sweets, breads etc. The app is easy to use and the daily audio "shorts" helped to keep me motivated and excited. I live, live, live this app! Videos are awesome and the shopping list is a GEM! Although I still don't know what a "shot of red cabbage" is (?) everything else is easy to follow and yummy! Yes, I lost my 7 lbs and will turn to this detox when it comes time to do it again! I LOVE this app and the portions Jason recommends. I've never been much of a vegetable eater and needed a really good way of getting my veggies in. Thank you, Jason!! I've done it for 2 weeks and its already changed my taste buds! Yeah!!! Um I paid for this app but it won't open. $7 down the drain :( I really wanted to try this. Yes it's expensive, but it does exactly what it advertises. I lost exactly 7.5 lbs. For those who think, "what will I do after 7 days?" He tells you how to ease into solid foods and encourages the program every season. It's worth it if you have the money. Highly recommend a wide mouth juicer it will save you lots of time. Anyone complaining about this app is a fool, they're either broke and shouldn't have bought this in the first place or don't have strong enough desire to lose weight because it will work. Does what it promises. Custom Grocery list, reminders and vids. Worth every dime. Jason's recipes are delicious. I love the app and the coaching videos. No Calorie count, boring recipes that can be found basically anywhere, very little of interest. do not get this app!!!!!!! Do not visit the store!!! I found their blenders up to 100$ less quite easily. & who has time to make 6-8 juices per day??? Got me addicted to juicing! Im not sure what others were expecting, but this app is a lifesaver! As new to juicing, it energized me to buy a juicer, use all the recipes, and lose weight, whith adding energy. I was SO encouraged by Jasons wild energy in the videos! The shopping list was perfect, and i. Going to keep using this one. I love this app. He takes all the guess work out and provides everything you need to be successful during the program. Easy for beginners to juicing to use! I watched super juice me and got interested in the short program. I read the book on kindle to prepare and shopped & shopped for produce! It worked like a charm. I lost 7lbs and started loosely using his 14 day plan. The juices were delicious & filling! I still use them once a day. I was off work & didn't have to cook for others so it made it very much easier for me. This app was great, and I liked the coaching each day. Good buy! FANTASTIC! EVERYONE SHOULD GET THIS APP!! I FREAKING LOVE IT! BEST APP I EVER BOUGHT! I loved this. Kept me going the whole time. I hope I can keep on this path! I was very excited about this app after reading all the wonderful reviews... First I thought it was kind of weird having to buy 38 apples for 2 days of juicing... Then I started reviewing the program and he uses the same juice recipe every day, with the exception of 1 different juice starting on day 3!!! How can anyone have good nutrition drinking the same juice every day.. Plus it's super boring!! I've juice before, but the plans out there will not repeat not even one recipe in a entire week!!! Don't pay $6.99 to drink the same juice very day...: it's just outrageous!! I lost 5 kilos in 7 days. Amazing. This app is great. 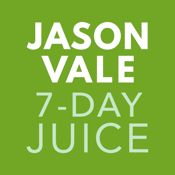 Jason explains everything and how to juice your fruits and veggies. I lost 9 lbs on 7 days and was not bored or hungry with the variety of this week long regiment. 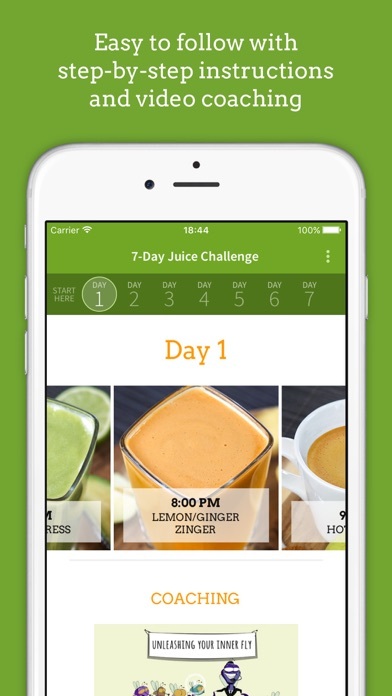 Highly recommend this app to anyone wanting to start over continue juicing! Use it everyday! Extremely useful! I tried it out for week but still ate regular dinners of lean protein and complex carbs instead of the last juice of the day. I didn't think I'd lose much weight since I wasn't following the plan exactly but I still lost a pound a day! I felt great too! Now my husband wants to try it. It's easy to use and I love the motivational videos and audio clips. Well worth the money! Best app I have ever bought! Best app I have ever bought! This app makes both the 7 lbs in 7 days and the 14 day programs 100 times easier. Almost everything you need to know is on this app the only thing missing is the mentality built up which you get from reading the book. I highly suggest you buy this app if you are planning on doing the program and you will always have the recipes at your hand when you finish. I thought I might really stick with this for a week but the recipes don't vary enough. 14 Day Plan not downloading??? I bought the in-app 14 Day Plan, but it does not show on my iPhone of iPad??? Why is it so large??!! I have been sick on and off and wanted to try something different other than taking more medicine. After one week I feel much better, more energetic, and the bonus- I lost 8 lbs! Well recommended for a healthy diet boost. Never ate/drank so many fruits and veggies in my life. First two days were a little rough. By day 3 you start feeling so much better. Day 7 you are noticing that your clothes fit better, and you want to continue with better eating habits. I didn't think this app would work or help me lose 7lbs in 7 days but I was wrong. It does work but you have to follow the plan to the "T" and it's wasn't easy for a meat lover like myself to do but I did it. I like the fact that there's a shopping list feature and videos showing you how to make the juices. Also there are a few motivational audios too. I did purchase the in-app 14 day plan and it has everything but the audio and videos like the 7 day plan. For the first 2 days I used my BlendTec blender to juice until I purchased a Omega juicer and believe me there is a big difference in the taste. You can still use a blender by adding more ice or water but I would suggest buying a juicer for sure! To the creators of the app, great job and maybe include some cooking videos for the 14 day plan in a update? I love all the juices. Directions are very easy to follow. Very expensive for my budget, but I am using it in a way thats economical for me and it's working so far. Instead of replacing all of my meals, I'm replacing one to two meals and eating vegies and protein for my remaining meals and I'm drinking the lemon water every morning. Recipes are good and don't taste too bad if you drink them with a straw. Giving it a four star only because it's too expensive. The juices were very disgusting. I just couldn't get past the first juice of the day. I decided that this is not for me. Also, for seven days this diet is too expensive. You won't be disappointed one bit. Even for the price. I love this app! Recipes are amazing! The coaching is so inspiring! Great for anyone on there way into the juice community! This is a great easy to use juice app! 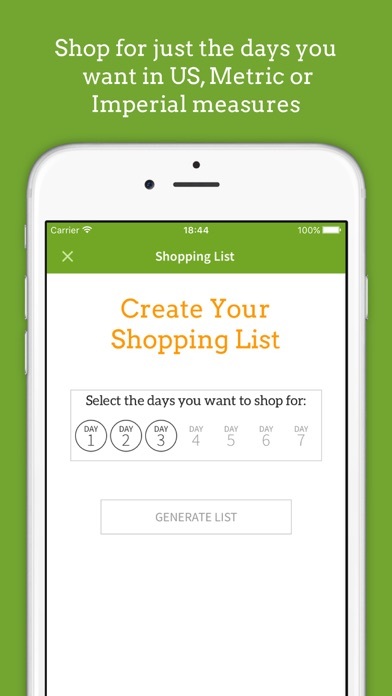 Jason makes it simple to follow and keep up with your shopping and reminders. This is my seventh day and I'm amazed with the results. My skin is healthier, all my clothes are now loose. My tummy is disappearing. I lost all the cravings for junk food. If you really do this step by step you will see amazing results. I absolutely love this app. I am on day 4 and feel so good and energized. Not hungry at all and all the juices very tasty. My scale has gone down 3lb on 3 days.